The University of Chichester’s sports teams are back in action after their mid-winter break. Chi’s women’s rugby team were home to Canterbury Christ Church in a season-defining game against a side that dished out a heavy defeat earlier in the season that derailed a good start to their campaign. Before the match coach Simon Carter said: “We’ve had a good few weeks of training and the girls have come back from Christmas buzzing. There’s been a real energy at training. It feels like a play-off stage now. “We’ve got quite an inexperienced team in the sense of the amount of game time that some of the players have had so losing to Canterbury was quite a good step for some of them because we’d won the first few games relatively easily and they thought it was going to be quite an easy season. Abi Hunt gave Carter’s side a dream start in the second minute when she burst down the right flank and over for a try that was converted. Chichester drove the ball close to the touchline 15 minutes later but Canterbury held firm. And then the hosts had chances on both sides. The visitors started to apply pressure and got back into things in the 26th minute before Gemma Carter ran in another try after a flowing move down the left, this time following good work from Amy Wrigglesworth to increase the lead to 12-5. Canterbury hit back, running in a second try just before the interval. Chichester found themselves behind 16 minutes after the break when the pace of the Canterbury No12 caused all sorts of problems. The same player was instrumental in the next try that took the score to 22-12, jinking past a number of players from the halfway line. The home side got a lifeline when they were awarded a penalty try with ten minutes left that reduced the points deficit to three. Canterbury worked both the ball and the clock smartly for a win that closes the gap on league leaders Royal Holloway and puts a bit more distance between them and Chichester in third place. The men’s rugby ones remain top in South Eastern 3A after beating Brighton while the twos lost 14-0 against Kent. The men’s football firsts faced Bath in a crunch game between the bottom two sides at the end of the Premier South regular season. Coach Danny Potter’s side began well. Barely ten minutes into the game a strong header from striker Iffy Onwuachu was deflected by a Bath defender into his own net. Then Lorenzo Dolcetti doubled the hosts’ lead from the penalty spot in the 20th minute. Bath hit back just before the break from close range. Onwuachu put the home side 3-1 up before the visitors pulled one back. And there was a heartbreaking late equaliser in the 90th minute. 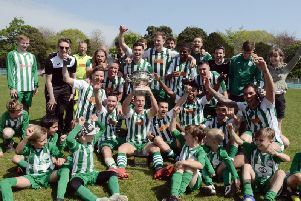 Chichester’s premier league fate is now in the hands of the play-offs. The Chi women’s football first team also played their last regular Premier South league game at home to Bath in a second-versus-third clash. Hertfordshire had built an unassailable lead at the top of the league but Chichester were guaranteed a runners-up spot whatever the result. When the sides met in the reverse fixture back in November Bath came out 3-1 winners and this proved a repeat. The score was 1-1 at the interval but the visitors hit two second-half goals as Chichester finished with ten players. In netball the first team lost at South Eastern league leaders University College London, Brighton beat the twos and the fours lost to Surrey. Chi’s men’s lacrosse suffered a 9-1 defeat against Sussex and the women were also beaten heavily by Royal Holloway. The men’s basketball ones lost narrowly to Reading and the men’s tennis team, who are having a good season, beat Royal Holloway.